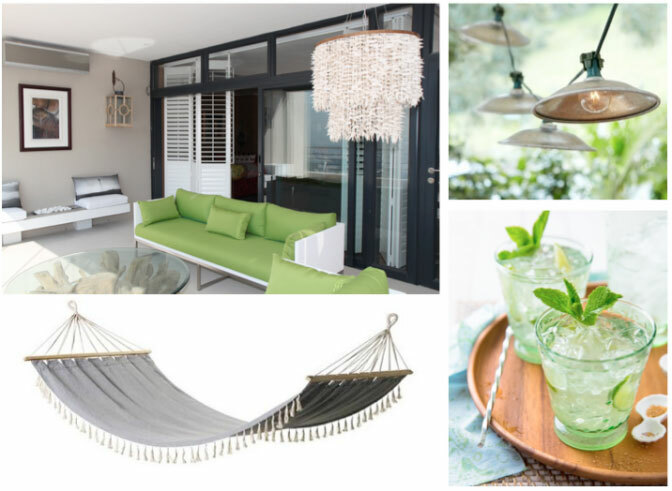 It’s party time, whether it’s a morning tea party, an afternoon braai, sunset cocktails or an evening dinner party; party time in summer time is patio time! It doesn’t need to cost a fortune to get your patio party-ready and proud, just some TLC, creativity, energy and time. Here are our tips on how to get the party started in your outdoor space. Just like the planning of a party, we look at venue, décor, catering and entertainment. Some homes come with lovely outdoor entertainment areas, others don’t and you may need to define the space yourself. Look at the floor, walls and ceiling you have or how you can create these. Use hedges or trellis with creeping plants as walls, reeds or a tree canopy as a ceiling and define the floor space with gravel, wood chip or a concrete slab. If you are lucky enough to have this space existing at your home, make the most of it by adding interest to the floor with a painted rug, planting scented plants to soften the walls or add string lights for a starlight ceiling. Important considerations when defining your outdoor space are privacy, shelter from the weather such as prevailing winds, rain and sun obviously the indoor outdoor flow and how the space works with your home’s interior. 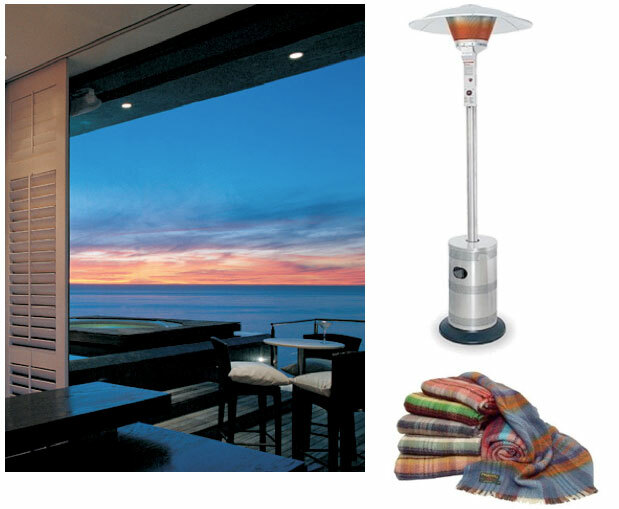 When choosing furniture and décor accessories for your patio, durability and resistance to weather are vital. Aluminium, plastic and certain timber furniture can withstand the elements and will last longer. Although slightly more expensive, using the right fabrics on outdoor furniture and accessories such as cushions and throws, will ensure they last longer and stay looking good. 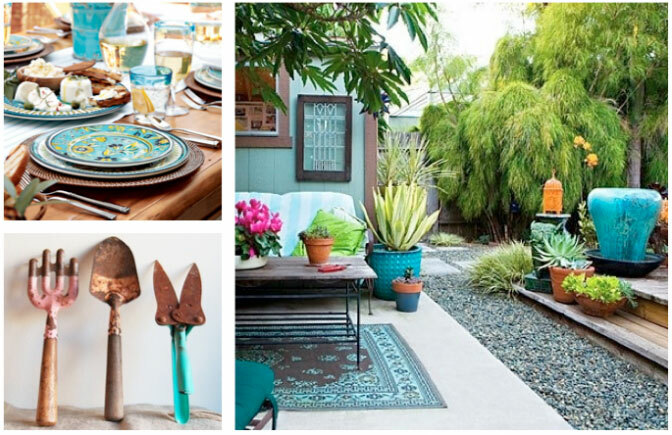 Get creative with the accessories you use, such as vintage garden tools, colourful pots and sculptured water features. If you are going to invest in permanent features for your outdoor area, make sure they add value to your property. Shutters are available in a variety of styles and finishes, and will not only enhance your patio appeal, but will add value to your property. Whether it’s a seated area for conversations and cocktails or a dining set up for braais and outdoor dinner parties, comfort is key. Make sure you have adequate seating for all by getting creative with unique seating ideas to cater for extra guests, from day beds to a recycled wheelbarrow, from tree stumps to hammocks. True to South African lifestyle, provide space for a built in braai or portable Weber. Space to serve food and drinks and if eating outdoors, space to enjoy your meal is vital so ensure you have enough table space or supplement it with side tables and trays. A drinks bucket also frees up valuable table surface. Keep the party going with well-designed space which directs your guests to make the best use of what you have on offer. Whether it’s a great view that can be taken in as guests mingle and enjoy good conversation or a swimming pool that invites guests to cool off or an improvised dance floor, having dedicated space for various activities ensures a comfortable easy flow and happy guests. Special touches to make sure your guests are comfortable are what set good parties and great parties apart. Have lots of ice and sunscreen to deal with the heat and outdoor blankets, an outdoor heater or fire burning to warm guests as the evening gets cooler. With your venue, décor, catering and entertainment sorted, it’s party on the patio this summer!